Theme: "Mobile Robotics, and preparing the future of automated manufacturing in Switzerland"
The event develops in the context of ROBOTS:10 festival. 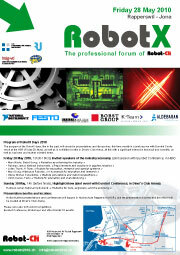 RobotX is the result of an initiative lead by Robot-CH as a response to the need of gathering a large variety of actors in order to meet the challenges of professional robotics. partner of organizations such as Hands-on-Technology, Planète-Sciences or Manufuture.